The Coronado is the perfect easel for painting at home or on the go! It is great for small apartments or large studios. You will enjoy the many uses this great easel provides due to it's compact size. 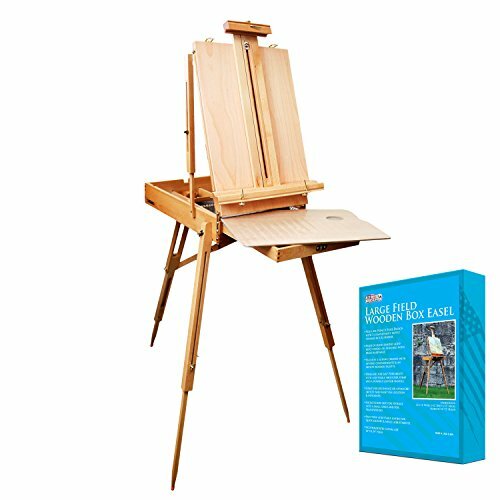 The Coronado Sketch Box is a fully adjustable field easel and storage unit all in one! Made of hand-sanded beech wood and a durable leather handle. It features a 12" Wide sliding drawer with divided compartments, a 11" x 18" removable wooden palette, adjustable shoulder strap. Fully extendable to 71" - It is small enough to store in a closet, yet large enough to hold a 34" canvas. Unfolded Dimensions: 28 1/2" X 45" X 71"
Folded Dimensions: 17" X 6 1/2" X 22"
Fully adjustable field easel and storage unit all in one! Extends to a full height of 71" and accommodates canvases up to 34". Unfolded Dimensions: 28 1/2" X 45" X 71" - Folded Dimensions: 17" X 6 1/2" X 22"